Mold, mildew, and moisture in our homes can lead to in-door air quality issues. Issues that may cause breathing problems especially for allergy and asthma sufferers. 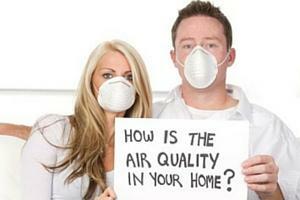 Many in-door air quality issues can be traced to excessive moisture and inadequate ventilation. A no-cost in-home energy audit will carefully look at possible sources of moisture and will then recommend the best ventilation options. Bathtub / Showers: A tremendous amount of moisture in the form of steam is released each time we take a bath or shower. All full bathroom (includes a tub or shower) should have a functioning bath fan vented to the outside. If venting goes through an uninsulated attic or other cold space an insulated hose must be used to help prevent steam from condensing. Avoid unnecessary bends or sagging in the hose which may allow condensed water to collect. Mold in attics can be caused by improperly vented bath fans venting directly into the attic above. Remember: Let your bath fan run continuously while showering and for 30 minutes afterwards. Energy geeks recommends bath fans such as Panasonic Whisper Fan that include an option for continuous use at low CFM. Dryers: A clothes dryer full of wet clothes can produce a lot of moisture. Clothes dryers must be vented to the outside. Avoid long runs (more than 25 feet) unless your clothes dryer is equipped with a booster fan. Remember each 90-degree bend in a dryer hose or metal elbow equals 5 feet of run. If a dryer must be vented through an uninsulated attic or other cold space an insulated hose must be used to prevent steam from condensing. Clean the lint from your vent pipe as often as needed. Remember: Flexible vinyl dryer hoses are a potential hazard and should be replaced with flexible metal or solid metal pipe. Cooking: Cooking certain foods can create a lot of moisture. All stoves should have a range hood. Range hoods should be vented to the outside. This may not always be practical when on an inside wall. Wall mounted mechanical fans venting directly through an exterior wall can be used if necessary. Damp basements: Consider a dehumidifier that drains directly to the outside (thus avoiding the need to physically empty). Be sure to raise the dehumidifier at least 12 inches above the ground to avoid drawing moisture up through the floor. Create natural ventilation by opening windows or stationary vents if applicable. A moisture activated wall mounted fan venting directly to the outside through a band joist is another option. Crawl spaces: Dirt floors should be covered with 6 mil plastic to keep moisture from rising. Create natural ventilation by opening windows or stationary vents if applicable. Dehumidifiers draining directly to the outside can be used. Moisture activated wall mounted mechanical fans are another option. Remember: Properly installed air sealing, insulation and ventilation will cure most moisture related problems.